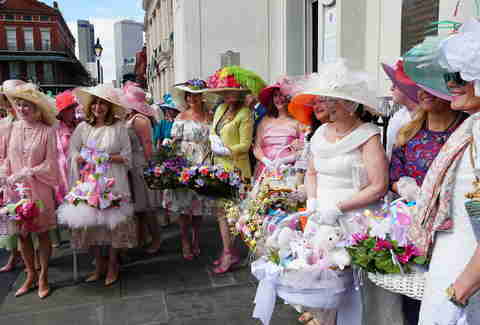 Let’s get one thing out of the way: while it’s true that New Orleanians are a show-offy bunch, seizing any opportunity to dress up and strut through the streets, there is at least some historic precedent to our Easter parades. Anyone who learned about Easter in Sunday school probably also learned about Palm Sunday, which is when throngs of the faithful turned out to witness Jesus’s triumphal procession into Jerusalem. He may have ridden a donkey instead of a float, and the spectators may have clutched palm fronds instead of beads, but hey… it sounds a lot like a parade. Anyway, all of that is to say that there’s no bad reason to throw a parade. However, parades do vary in terms of their aesthetics, cultural bearings and standards of etiquette. Read on to learn all about Easter parades, including when to go, how to dress, where to eat, and what to expect. 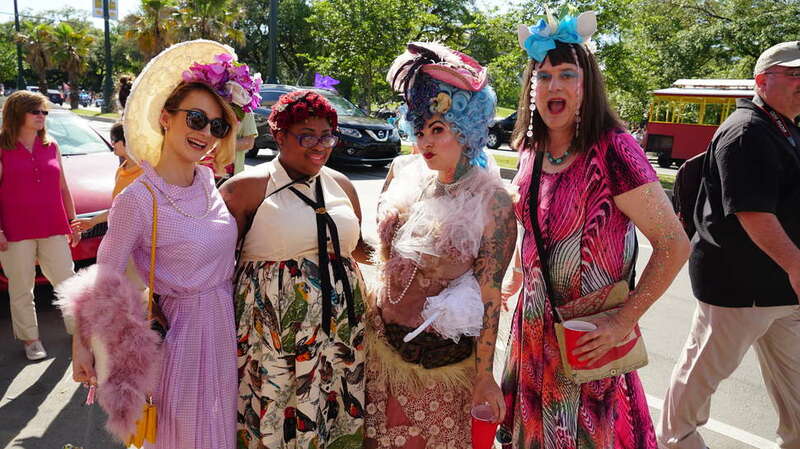 What's the deal with Easter parade culture in New Orleans? Like Mardi Gras parades (which herald Ash Wednesday and the ensuing 40 days of Lent) and Super Sunday parades (which take place on the Sunday closest to St. Joseph’s Day), Easter parades are tied to New Orleans’ Catholic traditions. For Mardi Gras and Super Sunday parades, the link to Catholicism is way less overt -- and decorous behavior isn’t important. In fact, cutting loose and costuming are the whole point. What are the biggest parade routes in New Orleans? Three parades roll on Easter Sunday this year, each slightly kitschier and more over-the-top as the day progresses. Not all of them are created equal, though. The earliest (and most conservative) of the three main Easter parades rolls at 9:45am Sunday, April 21 from Antoine’s (713 St. Louis St.), the oldest family-run restaurant in the US. Its carriages, convertibles and walking groups take a relatively short route through the French Quarter, ending at Jackson Square in time for 11am mass at St. Louis Cathedral (which, coincidentally, is the oldest cathedral in the US). After mass, participants return to Antoine’s to disperse and receive awards for best Easter attire and basket, among other things. 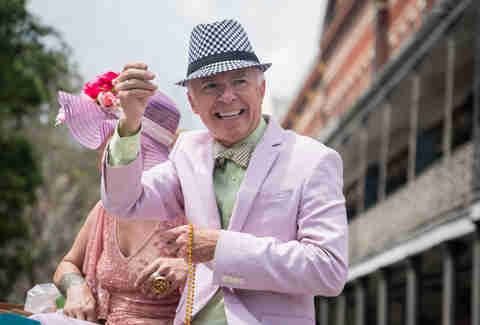 Chris Owens, the singing, salsa-dancing, leotard-rocking, octogenarian matriarch of Bourbon Street, serves as Grand Duchess in this yearly Easter extravaganza. The parade rolls through the French Quarter at 1pm Sunday, April 21, launching from the Omni Royal Orleans Hotel (621 St. Louis St.). It heads down Royal Street to Canal Street. From there, it turns right Bourbon Street, then proceeds to hang a right at St. Phillip Street. 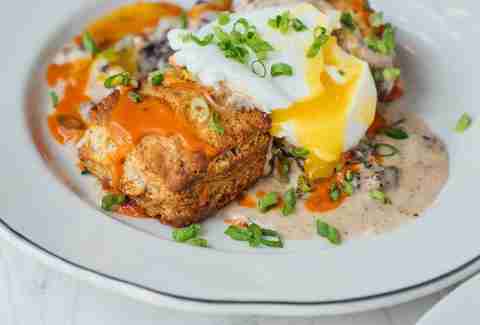 Finally, it turns right on Decatur Street and heads up St. Louis to loop back to the Omni Royal Orleans Hotel, where brunch commences. Expect marching bands, floats, Easter-centric throws and a fabulous custom outfit modeled by Owens herself. Sponsored in part by the oldest and most venerable gay Mardi Gras krewes (Petronius, Amon-Ra, Apollo), the 20th Annual Gay Easter Parade features elaborately decorated horse-drawn carriages, drag queens, brass bands, walking groups and so many bunny costumes. The family-friendly event takes place at 4:30pm Sunday, April 21 and is open to all. It kicks off at Louis Armstrong Park (701 N. Rampart St.) and rolls down St. Ann, then hangs a left on Bourbon Street and proceeds to Esplanade Avenue. From there, it proceeds down Royal Street to St. Louis Street before turning back onto Rampart Street and ending at GrandPre’s (834 Rampart Street). What does the weather look like on Easter? Forecasters predict a mild, sunny Easter Sunday with a high of 78 degrees, a low of 65 degrees, and a less than 10 percent chance of rain. So load up on sunscreen, grab a parasol, pull on some sensible-but-elegant flats, and hit the streets. What should I wear to the parades on Easter Sunday? Creative self-expression has a place at the Easter parade, as long as it’s filtered through a pastel-tinted, Sunday-best lens. Plenty of people at the Easter parades are on their way to or from church, so be sure to keep your ensemble and your behavior G-rated. You can’t go wrong with a seersucker suit or floral dress. Trick the look out with a boutonnière, pearls or lace gloves -- and take heart in knowing the modesty and decorum you exhibit from the waist down can be balanced out with a truly over-the-top bonnet and/or wig (check out the selection at Fifi Mahony’s or Fleur de Paris for inspiration). For an egg-citing spin on a traditional jazz brunch, try an Easter brunch. Plenty of restaurants roll out special menus for the religious holiday. To name just a few: Toups South (1504 Oretha Castle Haley Blvd. ), Chef Isaac Toups’ spot inside The Southern Food & Beverage Museum, offers a four-course tasting menu that includes foie gras and French toast. At Compère Lapin (535 Tchoupitoulas St.), James Beard award-winning chef Nina Compton serves Easter specials including spring salad with crawfish and hollandaise. Brunch reservations are still available at The Country Club, and The Roosevelt (130 Roosevelt Way) is putting together a brunch buffet with herb-roasted leg of lamb and glazed yams with toasted pecans. Any of these would be good options. So don’t fill up on Champagne, marshmallow Peeps and Cadbury eggs, no matter how tempting they may be -- and as with any parade situation, remember to pace yourself! Missy Wilkinson is in the market for a really glittery pastel wig. Follow her on Instagram at @nowlistenmissy.